Then they discovered that the plane was not an AN-26 transport plane after all. It was a Malaysian Airlines passenger plane. When this was discovered, Girkin’s post suddenly disappeared. Girkin (a.k.a Strelkov) has a checkered career at best. A self-proclaimed Russian nationalist, he is credited with organizing the rebellion against the Ukrainian government in the Donbas region of eastern Ukraine. He is, in short, a war criminal. He has been implicated with the disappearance and death of several separatist leaders in Chechnya and has been accused of participating in the Visegrad massacre in Bosnia. After flight MH17 was shot down, an order, supposedly from Girkin, instructed all those in his command to deliver any valuables they had found from the crashed plane (jewelry etc.) to his headquarters so that he could use this to fund his fight against the Ukrainian government. Whether this encouraged his men to loot the victims of valuables is not clear. Girkin is also said to be responsible for the wacky explanation that, instead of a plane filled with civilian passengers, the plane had been filled with corpses; apparently in the bizarre hope that it would then be shot down and implicate pro-Russian rebels in the downing. The only ones who ever gave credence to this nonsense were deluded members of the Russian media. 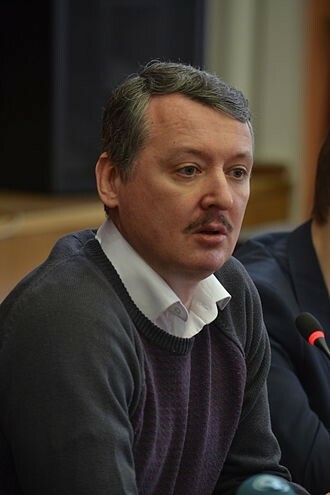 Girkin is currently being sued for $900 million by the families of 18 passengers. The Russian government quickly realized that few in the West, or anywhere else, would buy the corpse story. They then began to build up a story that the Ukrainian government was, in fact, behind the downing. At first, they claimed MH17 was downed by a Ukrainian fighter plane, but no such plane could be found on radar or satellite images. One photo that claimed to show a mystery plane was later discredited by experts. Russia then claimed that MH17 was shot down by an old Buk missile owned by the Ukrainian army, but further analysis of the source of the missile traced it to a region controlled by pro-Russian rebels. This has not stopped the denials from Moscow. Denial is a key strategy for muddying the waters, especially for those who are aware of their guilt. If 100% proof is not possible, and it rarely is, then denial keeps open other possibilities, no matter how remote. One of the newest strategies is to blame Ukraine for not closing its airspace. It’s the same as saying that a burglar is not responsible for robbing your house if you left the door unlocked. You are guilty, not the burglar. The most recent attempt at maintaining doubt was performed on the same day that the Dutch Safety Board released its final report on the MH17 incident. As a sort of preemptive strike, Almaz-Antey, the Russian state-owned maker of Buk missiles, held a press conference which attempted to show that the particular missile that downed the plane could only have been owned by the Ukrainian army. But as Dutch Safety Board chairman, Tibbe Joustra, remarked about the Almaz-Antey press conference, “it’s always special when people already know that they don’t agree with a report that’s not even published yet.” Indeed, it’s almost as if they knew that the report would further implicate the pro-Russian rebels. Now, it seems that maybe they did know what was in the report. On October 22, Trend Micro reported that the Russian-government-backed, cyber espionage group, Pawn Storm, had attempted an attack on the Dutch Safety Board’s investigation of flight MH17. On September 28th, the group launched a sophisticated phishing attack on members of the investigating team by setting up false servers. They also targeted a partner in the investigation. Trend Micro claims that they thwarted this particular attack by warning the targeted firm. In other words, the Russian government knew that the investigation would find the truth and implicate them in the downing of MH17. They had to get their hands on the report before it was made public to prepare a defensive strategy. They needed to muddy the waters with pseudo evidence, baffling statistics, and claims that the investigators never took Almaz-Antey’s data into consideration… even though the Dutch team actually did look at it. Putin’s strategy has always been to portray Russia as being a victim. Everyone is against Russia so all Russians must band together to fight against those who want to see it humiliated. This strategy has worked. Only 2 percent of Russians believe that pro-Russian rebels were responsible for the downing of flight MH17 and Putin has a 90% approval level. However, outside of Russia, few believe that Russia is an innocent victim. Russia would very much like to change this. The Trend Micro report states that Russia continued to attack the Dutch investigation team even after the report was released. This might be because the report stopped short of making accusations, deciding to leave this for a later date. The Russian government, therefore, has a reason for undermining this forthcoming revelation as well. Trend Micro does not make it clear if they have completely removed the attackers from the Dutch Safety Board’s network. It seems unlikely that they have or they would have mentioned this in their report. In any event, renewed attacks are likely. Whether Russia can gain access to this forthcoming report or not, we can definitely expect Russia to organize a new campaign to prove its innocence. Data can be tampered with, invented, or ignored in this attempt. No matter how great the evidence is in implicating the pro-Russian rebels, Russia will continue to deny it or twist the findings in their favor. But let’s face it. If Russia knew they were innocent, they wouldn’t have gone to all of this trouble to undermine the Dutch Safety Board’s report. Why didn’t Ukraine try to hack into the investigation? The answer: They didn’t have to. They were innocent and, therefore, had nothing to worry about. However, when the report comes out concluding that the pro-Russian rebels were responsible for downing flight MH17, don’t expect much to happen. Putin and the Russian press (now indistinguishable) will feign outrage. Possibly the West will impose a few more sanctions. And Putin will use this all to prove to the Russian people that everyone is against them and that they must rely on him to restore dignity to Russia. However, Putin’s attempt to portray Russia as a victim is wearing thin. Seizing territory in foreign countries, instigating uprisings that lead to bloody wars, shooting down passenger planes, supporting oppressive, blood-thirsty regimes, and instituting a mandatory blood doping program for all athletes has made Russia into an international pariah. If you were to hire someone to destroy Russia’s international image, you could have done no better than Putin has done. Instead of returning Russia to it’s pinnacle of former glory and respect, he has dragged it into an abyss of disgrace. Posted on November 10, 2015 November 10, 2015 by Steve MierzejewskiTagged Pawn Storm and Dutch Safety Board, Pawn Storm mh17, Putin denies downing of mh17, Russia downing flight mh17, Trend Micro. Next Next post: Are the Recent Attacks on FireEye Justified?